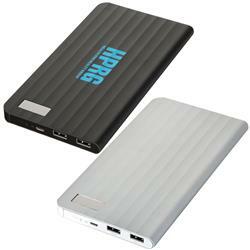 A designer power bank with a large battery capacity for both tablets and mobile phones. 15,000 mAh high capacity power bank with a beautiful wavy finish. Built-in LCD indicator shows remaining battery level. Patented design. Input: 5V/2A. Output: 5V/1A & 5V/2.1A. 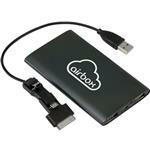 This is one of our favorite custom large capacity power banks! Dimensions: H 7" x W 3 15/16" x D 7/16"
Typical Imprint Area(s): H 3" x W 2"